The latest forecast track, released at 11 a.m. Wednesday, shows the storm riding the coast from Florida to South Carolina, then moving eastward into the Atlantic Ocean and making a southeasterly turn. While the forecast is subject to change, the new prediction shows that the storm will not be affecting New Jersey in any significant way by Monday. The storm will briefly make landfall in Florida near Fort Pierce and Port St. Lucie before making the northeast – and then southeast – turn. After that period of time, the forecast is still up in the air. And monitor the forecast. 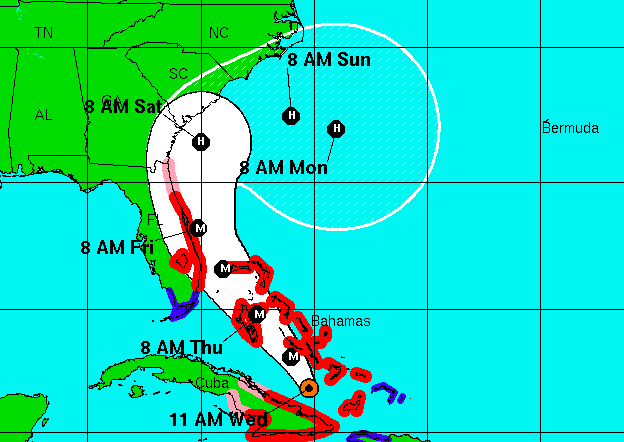 Yes, the #Matthew forecast has changed for the better in our region. But, I doubt that forecast is done changing. Uncertainty still abounds, meteorologists were saying. New Jersey residents were still cautioned that the storm could kick up heavy surf – making swimming or boating in the ocean dangerous.